Major advantages of diaphragm wall are listed below. 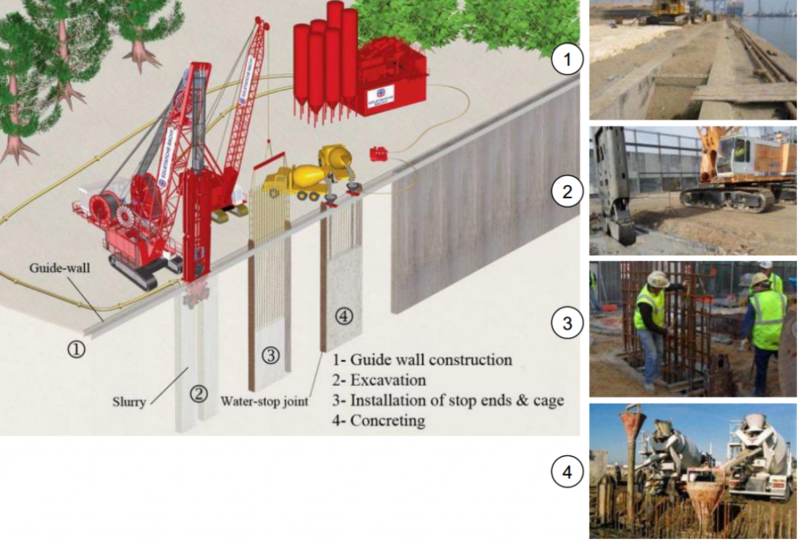 Guide wall – guide wall is two parallel concrete beams constructed along the side of the wall as a guide to the clamshell which is used for the excavation of the diaphragm wall trenches. Trench excavation – In normal soil condition excavation is done using a clamshell or grab suspended by cables to a crane. The grab can easily cut through soft ground. In case of encountering boulders, a gravity hammer (chisel) will be used to break the rock and then take the spoil out using the grab. Reinforcement – reinforcement is inserted in the form of a steel cage, but may be required to lap a few sections in order to reach the required length. Concreting – placing of oncrete is done using tremie pipes to avoid the segregation of concrete. As Concrete being poured down, bontonite will be displaced due to its lower density than concrete. Bontonite is then collected and reused. Joining for the diaphragm wall panel – Diaphragm wall cannot be constructed continually for a very long section due to limitation and size of the mechanical plant. The wall is usually constructed in alternative section. Two stop end tubes will be placed at the ends of the excavated trench before concreting. The tubes are withdrawn at the same time of concreting so that a semi-circular end section is formed. Wall sections are formed alternatively leaving an intermediate section in between. The in-between sections are built similarly afterward but without the end tube. At the end a continual diaphragm wall is constructed with the panel sections tightly joined by the semi-circular groove. 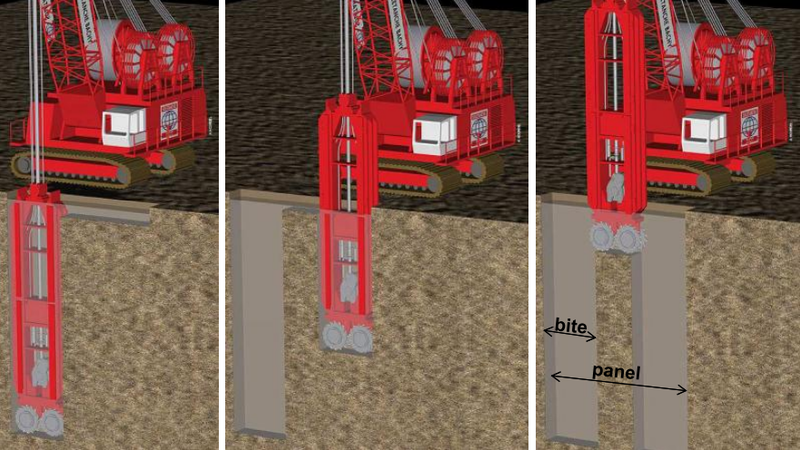 Bored piles of square section can be installed using the Hydrofraise or similar drilling techniques. The bore hole is stabilised by drilling mud. The “Hydrofraise” is a drilling machine powered by three down-the-hole motors, operating with reverse circulation. A heavy metal frame, serving as a guide, is fitted at its base with two cutter drums carrying tungsten carbide tipped cutters. These rotate in opposite directions and break up the soil. 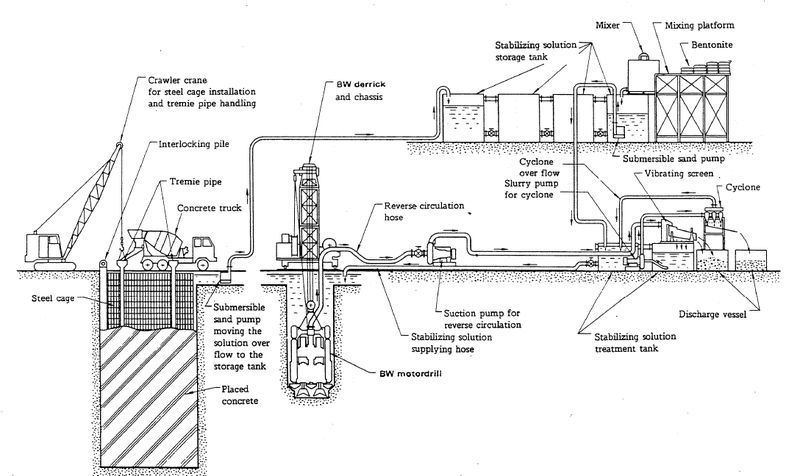 A pump is placed just above the drums and evacuates the loosened soil, which is carried up to the surface by the drilling mud. The mud with cuttings is continuously filtered (desander unit) and then poured back into the trench. A heavy crawler crane supports and manipulates the machine. It carries the power pack supplying the hydraulic power, which is conveyed through hoses to the three down-the-hole motors, two of them driving the cutter drums and the third driving the pump. The hydraulic cutting device is designed to give the cutter drums a high torque at low speed of rotation. The guide frame is suspended from the cable-operated crane. A hydraulic feed cylinder is used to achieve a constant rate of advance or to maintain a constant weight on the cutter drums. Another important advantage is that the drilling mud is constantly screened and desanded during excavation. Thus the reinforcement can be placed and concreting carried out as soon as the required depth has been reached. This excavation system makes it possible to drill piles panels or diaphragm wall elements in a very wide range of soils, from cohesionless soils to hard rock.